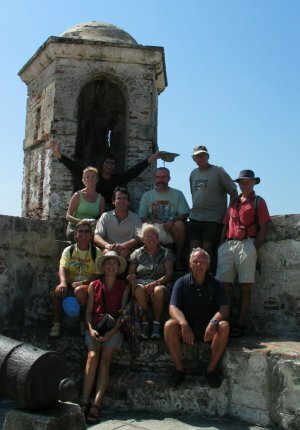 We arrived in the old Spanish fortified port of Cartagena de Indias on 6th February, after a three-day sail from Aruba. The last day of the trip was a fast roller-coaster ride in 15 foot seas, averaging over 7 knots with just a well-reefed foresail. We entered the huge natural harbour of Bahia de Cartagena through the smaller northern entrance over a defensive dyke built in 1778 to keep out enemy ships. Luckily, there is a narrow channel with enough depth of water for Nechtan and her 6 feet draught. Guarding the entrance to and marking a shoal patch in the inner part of the Bahia de Cartagena is the statue of the Madonna and Child, which seems to float on the water. Looking towards the old town from the Club Nautico anchorage. 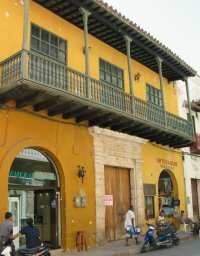 Cartagena was founded in 1533 by the conquistador Pedro de Heredia. His portrait shows him with a strangley deformed nose - this was the result of it being cut off in a duel and a doctor grafting on a piece of his bum to replace it (plastic surgery in the 1500's!). Presumably, he spent the rest of his life sniffing and saying "Do you smell something funny?". Anyway, Cartagena quickly became Spain's main port on the Caribbean coast. 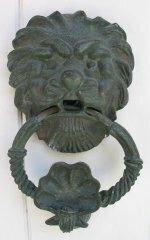 It was a gateway for looted gold from South America to Spain and as a result was regularly attacked by pirates and privateers (i.e. pirates who had the approval of their own king or queen), including England's own Sir Frances Drake. Spain's response was to build extensive fortifications, many of which survive to this day. 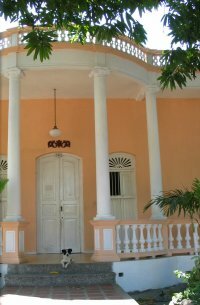 As an example of Spanish colonial architecture Cartagena is therefore hard to beat. It's also a very friendly and relaxing place and, when you feel too relaxed, Colombian coffee must be the best in the world! Take that with a local sponge and custard cake, pinono, and you have a perfect mid-morning break. Sir Frances Drake stayed here after taking the city in 1586 (that's his scooter still parked outside!). Tom's favourite bread at the Carulla Supermerkado . Cartagena comes alive in the evening when people just stroll around and enjoy the cool air after the heat of the day. Left: The steeple of the main cathedral. Right: The statue is Simon Bolivar, just as revered here as in Venezuela. 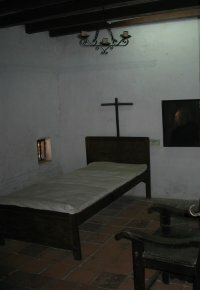 With most visitors to South America in the 1700's passing through Cartagena, the Holy Office of the Inquisition thought this an ideal place to set up base. 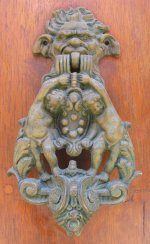 The Spanish Inquisition has a reputation for being a group of brutal religious zealots. Having toured the museum in their former Cartagena headquarters, we can confirm that that's exactly what they were. Their job was to hunt down, torture and prosecute (usually by burning at the stake) heretics, witches and protestants. Amongst their weaponry were such diverse elements as fear, surprise........and big sit-in weighing scales - witches were really light you see, so that they could fly! - the original scales are now on display in the museum. Of course if the alleged witch was a bit on the heavy side they could adjust the scales so that she seemed light - there was no escape if they really wanted you! Denouncing someone was easy - write their name on a piece of paper, hop on your horse, ride by this window and pop the paper through the bars of the Ventana de la Denuncia. The "dobberin" remains anonymous, unlike these two scoundrels! 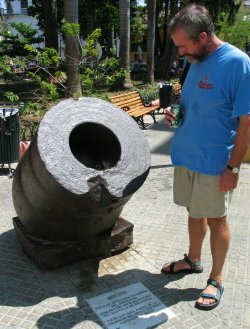 A mortar from the 18th century. The British navy under Admiral Vernon attacked the city in 1741 with a fleet of 100 ships, 8,000 soldiers and 12,000 sailors against a Spanish defensive force of just 3,000. Vernon was so sure of himself, he sent news of the fall of Cartagena to London before it actually happened. Victory medals were struck and everyone celebrated back home. And guess what? - the British lost. The defence of the city was led by General Don Blas de Lezo, a seasoned military man who had lost his left leg in a sea battle, was blinded in one eye in another battle and lost the use of his right arm in yet another, all before he was 25! However, he did have 17 children, so bits of him were still working pretty well! Unfortunately he was hit in his remaining leg by a musket ball during Vernon's attack and subsequently died from gangrene. 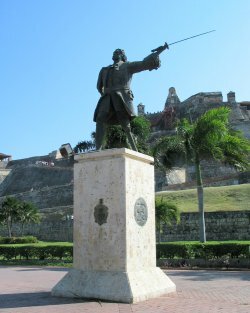 Don Blas de Lezo, defender of Cartagena against Admiral Vernon in 1741, with San Felipe fort in the background. One of the main gates into the old walled city. The streets are a living museum of old colonial buildings with overhanging balconies. You can tell from the walls that this is old! - most construction of the Main Cathedral took place in the late 1500s and 1600s. The modern-day Convention Centre - not exactly pretty, but up close the exterior marble walls are a geologist's delight! Fun sculptures adorn one of the plazas in the Old Town. Eat your heart out Tesco, Asda and Safeway (Scottish supermarkets) - this is the BACK door of the local Carulla Supermercado!! Some of the houses in Cartagena's suburbs were beautiful! In the Old Town of Cartagena doors and windows were very tall, apparently so that you could enter your house while on horseback! 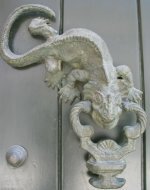 Also, doors with lots of decorative knobs and fancy knockers were supposed to indicate to passers-by that the occupants were of the wealthier upper classes. A view of Bahia de Cartagena from the highest point in the city, the Convento de La Popa. A view over the Old Town of Cartagena, with the La Popa Convento in the distant middle background (see previous picture). 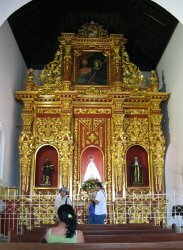 The altar inside the church of the La Popa Convento. No longer required as the Santa Teresa Convent ... no matter, convert it into an hotel! This cool courtyard is now at the centre of the Charlestown Hotel. Bruce from "Chewbacca", Duran and us paying homage to Simon Bolivar. While we were in Cartagena, we also took a bus trip up the coast to the oldest surviving town in Colombia, Santa Marta. It was founded in 1525 and was where Simon Bolivar died in 1830. We enjoyed the 4-hour bus trip there and back as much as the town itself as it gave us a glimpse of the countryside and villages in between. You have to be very careful travelling by land in Colombia as armed robberies and kidnappings are commonplace, either by one of the left-wing guerilla groups or just good old-fashioned robbers. But we were in the capable hands of Duran, a superb English-speaking guide, so were safe enough. Another day Duran took a group of us cruisers on a trip around Cartagena taking in some most impressive features, including the Castillo San Felipe de Barajas. Construction of this impressive fort began in 1657 and later work added defensive walls and underground tunnels and galleries. The Castillo San Felipe de Barajas is extensive and foreboding ... and a very long hot walk up! 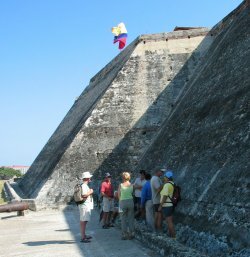 The walls of the Castillo are extremely thick and steeply sloping so that attackers' cannon balls would do less damage. 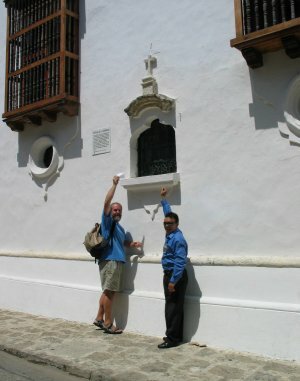 Tom points out that much of the stonework of the Castillo is brain coral. The scurrilous mob: Niall and Clodagh from Chipita, Ding from Chiquita, Richard and Chris from Shamaal, Nick and Terry from Slowpoke, Gillian from Khamsin. Another part of Duran's tour took us to the Teatro Heredia where guide Tomas told us all about the history and recent renovations of the theatre. In the stalls of the beautiful Teatro Heredia with Tomas and Duran. The beautiful ceiling and chandelier in the theatre. The stage fire screen has images depicting the history of the city of Cartagena - hope there is never a fire. Of course Richard and Chris coudn't resist the lure of the greasepaint, bright lights and audience cheers and gave us an impromptu rendition of "In Dublin's Fair City". They sure knew how to make settees in the old days! We saw some Colombian cigars being hand-rolled. 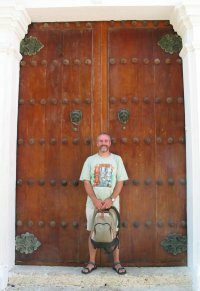 When we visited the San Pedro Claver Church and Convent we were lucky enough to find another English-speaking guide, Willy. He told us how Pedro Claver was born in Spain in 1580 and at the age of 22 joined the Jesuits. He arrived in Latin America in 1610 and in 1616 was ordained in Cartagena. He dedicated his work to the care of slaves sent from Africa. He died in 1654 and his bones are preserved in the church which bears his name. A cool, quiet corridor looking out into the cloister of the San Pedro Claver Convent. An altar incorporating the robes of Pedro Claver in the glass case at the base. Hanging in the far right of the room are slave chains. No expense spared and all mod cons in the cell of Pedro Claver. Incorporated into the base of the beautiful marble altar of the San Pedro Claver Church is a glass case containing the bones of the saint himself. As with so many historic buildings there is constant renovation required and we were lucky enough to be able to visit one part of the convent where the restorers are at work. 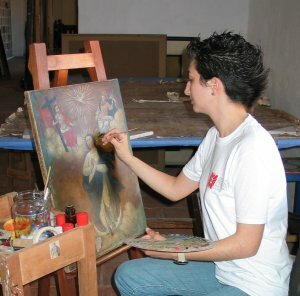 Restorer Mariane was happy to show us examples of the restoration. Below is part of a frame for a painting. Tom looking delighted to be lugging heavy water containers about. But it's not all tourist fun - there are always jobs to be done! Cartagena was a pleasant surprise to us. Parts of Colombia are definitely out of bounds to normal tourists like us (ok, you get crazy German backpackers everywhere! 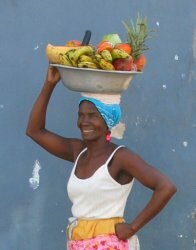 ), but Cartagena is friendly, safe and full of historical interest. After two weeks of city life, it was time to move on. Next stop, Panama.